The Purobio Blender Kit contains 2 make-up sponges of different sizes (one small and one medium). They offer you a precise application and a uniform result of your makeup! Thanks to their egg shape, they make it possible to work small areas of the face and also big ones. 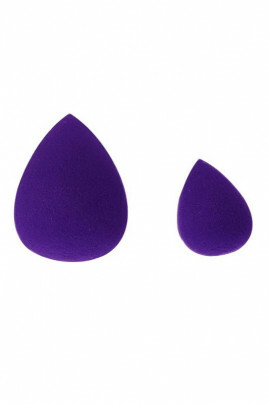 Made of polyurethane, they are used both for the application of fluid cosmetics and powder products. Hypoallergenic and dermatologically tested, they are ideal for sensitive skin. The Purobio Blender Kit is the essential makeup accessory to have! How to use the sponges of the Purobio Blender Kit? Round and lateral part: The rounded tip allows a uniform application of the foundation. Impregnate the sponge with the material and gently pat the face from the forehead to the chin without forgetting the cheekbones. Pointed tip: The tip allows you to reach the precise and difficult to reach areas of the face. For example, it will be very useful for the application of concealer. Impregnate the correction sponge and gently tap the area to melt the material. You can use it to correct dark circles or conceal small imperfections. To preserve your sponge as much as possible, it is recommended to clean it after each use.